THESE REFUGEES ARE BUILDING HOUSES OUT OF PLASTIC BOTTLES | "Global Possibilities"
Plastic bottles prove surprisingly resilient to the harsh desert conditions. TINDOUF, ALGERIA — As the sun rises on the Sahara desert, Tatah Lehbib begins his 2.8-mile walk to the garbage landfill just outside of the Sahrawi refugee camp, where he finds the long-sought treasure to help his people endure living in one of the most inexorable places on Earth: plastic bottles. Across five separate camps, about 160,000 Sahrawi refugees live here in southwestern Algeria, depending on international humanitarian aid while waiting to return home. In the meantime, for many of these refugees, including 28-year-old Lehbib, plastic bottles offer sustainable housing material in a desert referred to as the devil’s garden, where drought, heat, and seasonal floods destroy most adobe houses. Sahrawis, the indigenous people of Western Sahara, were displaced from their home country in 1975, when Spain withdrew from the region to let Morocco and Mauritania lay claim over the rich North African territory. The Polisario Front, a Sahrawi liberation movement, led an armed struggle for independence and declared the Sahrawi Arab Democratic Republic (SADR) in 1976. Mauritania retreated in 1979 and recognized SADR, while Morocco and the Polisario continued fighting until 1991, when a U.N.-sponsored ceasefire agreement called for a referendum over whether to form an independent state or become part of Morocco. Over 20 years later, that referendum still hasn’t taken place, as Morocco refuses any process that would include independence as an option. Lehbib was born in the Auserd refugee camp, and grew up in an adobe house and a tent in the dunes. He got the opportunity to study renewable energy at Algeria’s Tlemcen University, before winning an Erasmus scholarship to pursue a master’s degree in energy efficiency at the University of Las Palmas of Canary Islands. When he returned to his parents and community, Lehbib knew he wanted to lessen his people’s suffering. Lehbib starts each day with a long walk to collect bottles from the garbage. A colleague joins him, and they stay all day long, assembling as many bottles as possible. 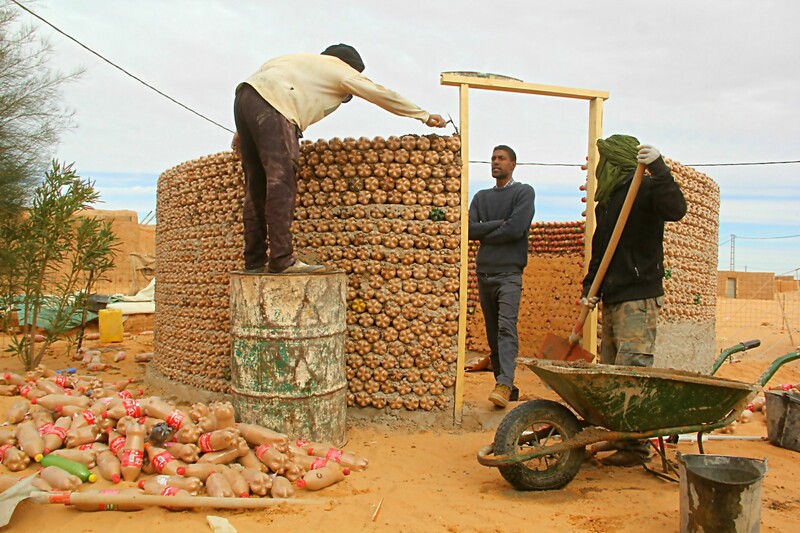 Later, a truck takes the bottles to the center of the Auserd camp to be filled with sand and then transported to different construction sites. The bottles are assembled and bound with a cement mix, and once finished, the house is resistant to the area’s harsh climate. The efforts to amass bottles are now of a greater scale, and Lehbib has embarked on an outreach campaign to schoolchildren. He asks whether any of the students have ever heard of the plastic house. Some say yes, and others are eager to know what it is. Lehbib distributes photos of his sustainable house, and some kids smile, while others are in disbelief. The project is also important for dealing with the problem of plastic waste. Sahrawi refugees have been living in the camps for over 40 years, and plastic bottles are simply piled up in garbage as there is no capacity to recycle them. One 2014 study by the United Nations Environment Programme (UNEP) found that worldwide, approximately 280 million tons of plastic is produced each year, but only a small percentage is actually recycled. One 2015 study found that between approximately 5 million and 13 million metric tons of plastic waste ended up in oceans in 2010 alone. Another conservative estimate found that the ocean now has more than 700 pieces of plastic per person on the planet. On the other side of the camp, Alhavra Sidimohamed lives with her mother and brothers. Next to their tent is a house of Coca-Cola bottles, fortified with cement and decorated with yellowish wood windows. “I thought it was impossible to erect a round house with plastic bottles,” Sidimohamed said, sitting next to her mom. “But when they came and built me one, I was amazed how quick it was, a week only.” Each new building reinforces the plastic bottle houses’ popularity, driving other people to plan their own. 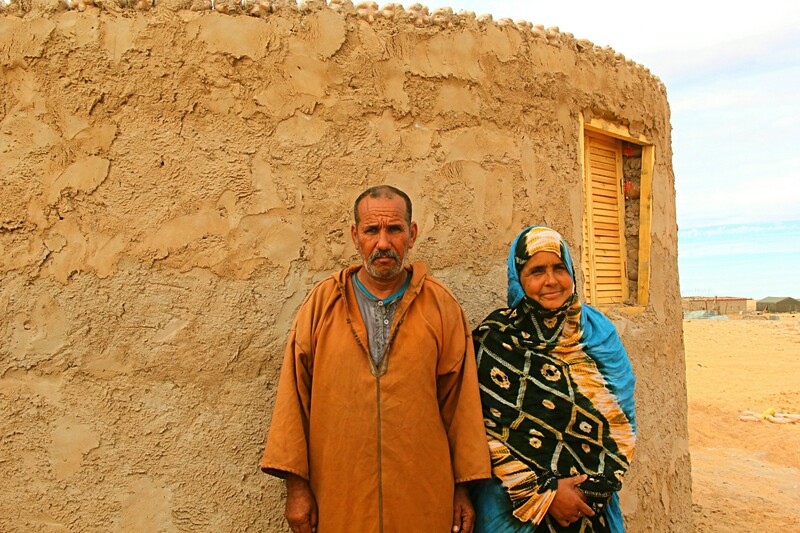 “My son Alwali, a shepherd, wants to construct a similar one in the countryside of Western Sahara,” Sidimohamed’s mother told ThinkProgress. Another brother, Nafaa, who just came from Dakhla, the furthest of the refugee camps, about 125 miles away, aspires to get one as well. “When I go back to my family I will immediately start collecting bottles and build a house, too,” he said. The success has made Lehbib popular in his community and even in other camps, where many children shout at him by name, while others ask if he needs more bottles. But still, Lehbib hopes to continue reaching to more people.